So far we had done all our safaris in a relaxed mode, starting quite late in the day, allowing Adi to complete his sleep. Andrew pointed out that the same strategy would not work at Amboseli, since the dry terrain and climate completely ruled out any mid day travel. The only possible touring hours were early morning and post four in the evening. Hence as the day broke out to announce 2012, we found ourselves inside our travel van at an unbelievably “early” hour of seven thirty – with Adi rubbing his eyes and an equally dazed Aamir following him. Andrew was determined that we start the day (and the year) royally; and the wireless radio, as if responding to him, faithfully called out simba. It was indeed a roaring start to 2012 as we took eight eyeful of a pride of about eight to ten lionesses – in a mood of blissful leonine lethargy – heavy eyelids barely managing to keep open, heads tucked in arm pillows - only one of them bothering to attend to some self grooming. Sensing their somnolence, a lone spotted hyaena had ventured near the pride; probably driven out of hunger to look for some spoils, but wisdom prevailed soon as it did a quick vanishing act. If there was any further evidence required for the lack of motivation for any sort of energetic pursuits on the part of the lionesses, it came in the form of a Thomson’s gazelle grazing a little distance away - the gap anything but safe. The lionesses were fully cognisant of the gazelle’s presence, some of them even had it marked in their sights; but with (what appeared to be) already appeased tummies, inertia was the overruling force. There was a herd of elephants behind the gazelle; they of course had none to fear - probably the reason why the gazelle could feel so confident. The lionesses even with hungry stomachs were not likely to be too keen to interrupt day-long elephant feeding rituals. Is it a matter of any surprise that the animal that we would meet next in the termite land is their terminator - bat-eared fox, the only canid (i.e. of dog family) to have largely abandoned mammalian prey in favour of insects. The places to find them are near large animals like zebras, wildebeest, and buffalo because that's where the bugs are. Sprouting new grass imply the presence of termites, with dung piles around can dung beetles be far behind? Bat-eared foxes play an important role in termite control - a single bat-eared fox can eat approximately 1.15 million termites each year, obtaining much of their water from the body fluids of these insects. We saw a group of five foxes sitting in a huddle - short narrow pointed mouths, long jackal-like legs and as the name suggests, large wide ears. The ears can grow up to over 5 inches long, enormous for an animal that stands between 11-16 inches at the shoulder. The giant ears are full of blood vessels that shed heat and help keep the fox cool (yes we have heard something similar for another animal with mammoth ears - the elephant). But the primary function of these specialised ears is to locate food. They can hear larvae chewing their way out of an underground dung beetle ball or harvesting termites chewing on short grasses! Surviving on an all-insect diet required several other adaptations - specialised extra teeth for chewing up insects, and lower jawbone designed to open and close rapidly. One especially noteworthy characteristic about these foxes is the prevalence of daddy day care system - the father fox actually takes on babysitting responsibilities while the mother is off foraging. In fact, the mate for life and live-in-with-young papas spend as much, if not more, time guarding, grooming and rearing the babies as the mammas! Up ahead, we saw a lone wildebeest standing in the middle of nowhere. Then some distance away there was another. We kept meeting a few from time to time – all standing alone, very still, over large tracts of grassland. We were wondering what this could mean when enlightenment came from Andrew. These were bachelor males who did not migrate to greener pastures. They chose instead to stay back to establish territories, marking and safeguarding their empires, waiting to impress females once they return from migration - "will you walk into my parlour"? The biggest surprise of Amboseli is its bird life. I never thought that anything avian could be spotted in this dusty land, but in reality the intensive agriculture along the system of swamps makes this low-rainfall area a great attraction for birds. They were all there - flocking to the desert in great numbers. Blacksmith plovers with their black prints over white, peering through their red eyes. A grey crowned crane with its red wattle and golden-yellow crown. A plain looking brown Kittlitz’s plover, probably immature still growing its black band around eyes and neck. Crowned plovers with white-ringed black caps and very red legs. Yellow-necked spurfowls with their unmistakable yellow throat collars on streaked brown bodies. The vividly multicoloured lilac-breasted roller, whom we have met on all our safaris, but ever so enchanting. Kori bustard with its bulky body supported on long legs - the heaviest flying bird in the world. I was absolutely thrilled to meet one for the first time; but could not help wondering if we can ever catch a male in its courtship display. It would be a sight to watch - with dark crest raised, white throat puffed out, wings drooped and white under-tail revealed. We were fortunate though to catch a glimpse of a wattled starling breeding male, startled by our presence, its yellow black face just about visible as it flew past green thorns. Even more transient was a red-billed hornbill, a dash of hazy red beak and blurred white spots on the wings as it flew away with a “kok kok kok”. Black and white Taita fiscals with shiny backs – one early bird had managed to catch its breakfast worm. A white-bellied canary who was more yellow than white. And a raptor too – a dark chanting-goshawk with red paws and fine black bars on the belly. In Amboseli, we had seen mammals, we had seen birds, we had seen insects (or at least their homes) – all that remained was to see a reptile. The thought turned into a reality when we spotted a member of reptilia, with an extraordinary unlike-reptile flashy appearance, its rich colours standing out from the overall dull brown ambiance, making it impossible to miss out on. 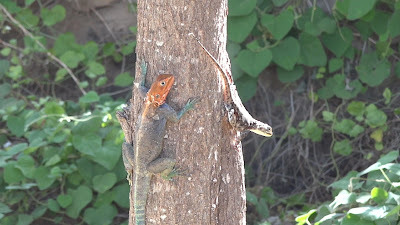 It was a rainbow agama or African red headed agama, often seen in the heat of the day. And it was a breeding male - a bright orange head on a shimmering blue body and blue-green legs (outside of the breeding season, the male is a plain brown); saintly eyes meditating on a mass of brown tree stump. It sat there patiently, head held high, giving us ample opportunity to capture the desert rainbow on camera. Back at the lodge, refreshed, rested and replenished, we sat in the lawn in the cool shade of a towering Nandi flame tree – one of the most attractive trees indigenous to East Africa. Blooms of blazing scarlet trumpets with yellow throats made themselves obvious in the leafy greens, certain to catch the attention of sunbirds. The flower buds of the African tulip or flame of the forest, as it also called, contain plentiful secreted water that squirts out when buds are squeezed or pierced, giving it the name 'fountain tree' or 'pichkari'. The chilly like fruit pods looked ready too – any time the winged seeds packed inside could take flight to grow into their own individual entities. The tranquillity of the atmosphere covered up the intense activities going on all around. The familiar “tsip weet-weet” could be heard as long tails of never stationary pied wagtails went up and down at a never varying pace. A troupe of vervet monkeys had descended on the roof top and suddenly there was simian presence everywhere, accompanied by the usual team grooming, playful teasing, scratching, jumping and rolling. Far away, in a mist of heat and dust, a herd of wildebeests, compelled by nature to keep on moving, were passing by. And there were others who find it their business to hold still. Perched on a branch overhead in a tree near by was a grey-headed kingfisher (a kingfisher that prefers grasshoppers, cockroaches and beetles over fish), a bird that can stay unmoving for long periods while watching the ground for signs of insects or small lizards, bobbing its head before diving on prey. The bird, while it surveyed the ground below, dazzled in the sun with its straight dagger-shaped orange-red bill, chestnut belly and black in the upper wings tapering to cobalt-blue lower wings and tail. An hour or so later, I found the kingfisher again, this time it was grasping an insect in its mouth – a reward for its patience. While a Maasai in traditional red chatted with Aamir on how lion hunting used to be a rite of passage to manhood for his tribesmen before the ban on lion hunting; and Adi played in the shade by himself, I found out that there was more of desert rainbow (another of nature's patient creatures) to be savoured. A lodge dweller Mr Agama in breeding colours was stationed vertically on a tree stem, head up and tail down. Not too far from his mouth, was the tail of a much smaller and not so good looking Ms Agama with plain patterned coat, who was positioned at forty five degrees from him, head arched high. The silent motionless courting went on for quite some time until a few drops of rain interrupted it. The drizzle made the male to stir to action; the female ran first with the male chasing right behind; and within no time, the rainbow had disappeared out of my sight.